Okay, this one is longish and I didn't understand all the economics stuff, but it shows that a solution CAN be planned. This one is a solution for the EU. It's got much more detail than the Leap Manifesto for Canada, and this article hints at much more detail in the actual plan. Read it anyway -- just skim over the parts that are jargon. The EU is facing a crisis of legitimacy—but retreating to the nation-state will only benefit the far right. Sign up for The Nation Daily. The American New Deal of Franklin Roosevelt's first two terms combined the goals of financial stabilization, reconstruction, conservation, and employment—jobs for the jobless; public works; power systems and new industries, especially in the South; soil conservation and reforestation to battle the Dust Bowl; and a potent mix of regulations and insurance to assert public power over high finance. Europe today needs all of these. Its overgrown banks, haunted by the specter of insolvency, are pushing households into foreclosures and evictions across the continent, and at an accelerating scale in the most depressed countries. States are bankrupt and will only become more so as the European Central Bank begins to tighten under pressure from German savers crushed by negative interest rates. Like America 80 years ago, Europe has a vast periphery. In its South, there is a semi-permanent Great Depression, whereas in the East there is great need for new and renewed industries, transport networks, housing, and social investments. Above all, Europeans need jobs. Unlike the United States in the 1930s, Europe is also facing the menace of disintegration, as the absence of a democratic federal system has spawned a crisis of legitimacy. Paralysis in the face of deindustrialization and chronic unemployment is breeding a toxic politics throughout Europe, with a postmodern form of fascism threatening some countries and a sense of hopelessness elsewhere. Europe has not yet suffered ecological calamities comparable to those in the past few weeks in Texas, Florida, and Puerto Rico; but they are coming, in the form of droughts, rising sea levels, and (most immediately) unstoppable waves of refugees from conflict and climate change in the Middle East and Africa. The Democracy in Europe Movement 2025 (DiEM25) has therefore proposed a European New Deal (END), inspired by FDR but designed for European conditions. Chief among these is the sad fact that the European Union is a weak and limited thing—a confederacy, more or less. The crisis has made it virtually impossible even to discuss the creation of a US-style federation in Europe, with full powers to budget and mobilize for the emergencies at hand. European polities are so alienated by the authoritarian incompetence of the current leadership—exemplified by the crushing of the Greek government in 2015 and the heavy-handed approach of the European Commission to Brexit—that an increase in central powers ("more Europe," as they say) would almost certainly meet heavy resistance. So it is necessary to work within existing charters and treaties to bring about stabilization by means of a European New Deal before hope is restored and the creation of new, democratic, federal, pan-European institutions—even a proper European Constitution—can be discussed sensibly and with cool heads. • A green transition, led by a new agency whose aim is to provide a continent-wide infrastructure focusing on the green Energy Union and the technological sovereignty that Europe desperately needs. • Economic and social stabilization, principally through a jobs-guarantee program to offer employment to all Europeans seeking work in their home countries. 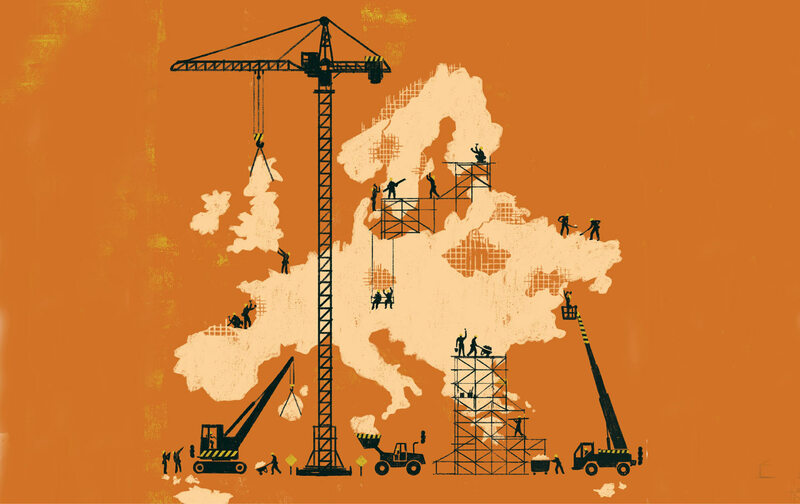 The jobs should pay a decent moderate wage keyed to national conditions, ending the involuntary migration flows within Europe that have been the cause of much discontent, and tied to a food-and-energy-stamps program and to social housing. • A universal dividend that would allow European citizens to share in the returns of capital and automation, democratizing the economic sphere and preventing the next crisis of low aggregate demand due to the worker- displacement effect of artificial intelligence. • A step-by-step banking union that (a) emulates the creation, by the Roosevelt administration, of the Federal Deposit Insurance Corporation; and (b) restructures all of Europe's problem banks, placing them under effective social control. • A program by which the European Central Bank mediates between states and money markets to reduce their total debt burden, but without money-printing or making Germany pay for, or guarantee, the public debt of deficit countries. • A Chapter 11–like public-debt restructuring facility for unpayable legacy debts (e.g., Greece's). absence of a federal treasury or a central bank with a suitable remit? The Green Transition Works Authority will be funded by a combination of (a) the European Investment Bank, which has the capacity to issue the necessary bonds, while the European Central Bank can stand by in the secondary markets ready to purchase the EIB's bonds, bolster their value, and reduce the interest payments; and (b) a continent-wide carbon tax. Any retreat to the nation-state will only benefit the xenophobic forces of the ugly right. For economic and social stabilization, we propose the creation of a European Equity Depository, into which the following income streams will flow: profits from the financial assets purchased by Europe's central banks (in the context of their monetary operations); other central-bank profits; and a pan-European inheritance tax. Finally, a percentage of shares from every corporate initial public offering and capital increase should be socialized and transferred to the European Equity Depository. The accumulating dividends, plus levies on the derived distribution of intellectual-property rights and on common-knowledge monopolies, will then fund a universal basic dividend. Then there is the euro. The currency shared by 19 of the EU's member states cannot be preserved in its current form, resembling as it does the gold-exchange standard, whose 1929 collapse led to the Great Depression. The euro has political and symbolic importance, both for its champions and its foes, but monetary systems are tools, not ends in themselves. So the euro must either adapt or cease to exist. The reality is that Europe created a common currency with an inflexible central bank and no federal state; that arrangement has ended in a predictable debt deflation. As a result, already the European monetary system is falling apart. There are countries (Denmark and Britain) that will never join the euro. There are others (Sweden, Poland, and Hungary among them) that are supposed to join in the future but apparently have no intention of doing so. And then there are Cyprus and Greece, which under capital controls have a de facto dual—currency system, since a euro in a Cypriot or Greek bank cannot be exchanged freely for a euro in paper or in another country's banks. Lastly, some countries in the eurozone would be better off outside, including rich countries like Finland. Given these realities, the vision of a comprehensive continental currency is not going to be realized. The European establishment must accept that false hope is bad strategy. Work should begin now on a new round of monetary reforms for Europe, giving the indebted countries of the region degrees of freedom without which the grapes of wrath will continue to "grow heavy for the vintage." To this effect, DiEM25's European New Deal is proposing a moderate, technically simple reform: the creation of a public digital-payments platform in every eurozone country. Using the existing digital platform of their nation's tax office, taxpayers would be given the opportunity to purchase digital tax credits, which they could use to pay one another or to extinguish future taxes at a substantial discount. These credits would be denominated in euros but transferable only between taxpayers of a single country, and would thus be impervious to sharp capital flight. Meanwhile, governments would be able to create a limited number of these "fiscal euros," to be given to citizens in need or for the funding of public projects. 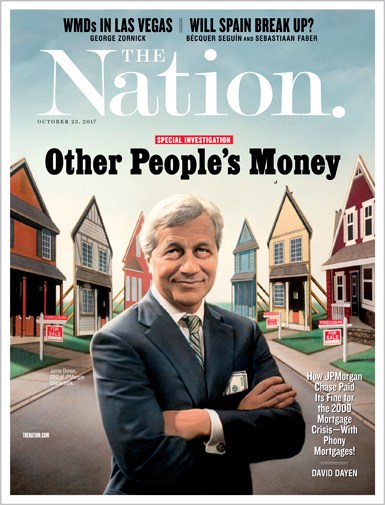 SUBSCRIBE TO THE NATION FOR $2 A MONTH. Fiscal euros would allow stressed governments to stimulate demand, lessen the tax burden, and, ultimately, reduce the crushing power of the European Central Bank. In the long term, these public digital-payment platforms can form a managed system of country-specific euros that work like an International Clearing Union, a modernized version of John Maynard Keynes's 1944 vision of what the Bretton Woods system should have been like—but, tragically, was not. DIEM25's European New Deal provides, we believe, the best chance for holding the European Union together. But should it be held together? Many progressive voices in Europe (and beyond) have been calling for the disbandment of the EU, due to its irredeemably neoliberal architecture, and a return to the nation-state as the realm in which democratic politics can be rebuilt before a new internationalism can spring up again, this time on solid foundations. They point, in much the same way as Burkean Brexiteers did, to the absence of a European demos on which a pan-European democracy can rely. DiEM25 begs to differ. Societies in Europe are facing four major socioeconomic challenges with the hallmarks of climate change. Just as global warming can never be addressed at the national level, even though local and national action is imperative, the same applies to the crises of (a) public debt, (b) banking, (c) exceptionally low investment (relative to savings), and (d) rising poverty. These will either be dealt with effectively at a European level or not at all, thus ensuring that any retreat to the nation-state will only benefit the xenophobic, militantly parochial forces of the ugly right. Beyond the practical need for a pan-European approach, DiEM25 embarks from something the left used to understand well: When Marx and Engels adopted their slogan "proletarians of the world unite," they were not rejecting the importance of national culture or of the nation-state. Instead, they were rejecting the idea of a "national interest" and the view that struggles must prioritize the realm of the nation-state. The notion that we must return to a one-nation/one-parliament/one-demos frame of mind would puzzle the left's 19th-century pioneers, as it would puzzle progressives of the early and mid-20th century, who dreamed of, and struggled for, a transnational republic from the Atlantic to as far east as possible. We need a pan-European network of rebel cities, rebel prefectures, and rebel governments. The left, lest we forget, traditionally opposed the bourgeois belief in a one-to-one relationship between a nation and a sovereign parliament. We counterargued that identity is something we create through political struggle: class struggle, the struggle against patriarchy, the struggle to smash gender and sexual stereotypes, and emancipation from empire, racism, xenophobia, and the practices of mass surveillance. In today's Europe, this spirit is not well served by calling for the split of the EU into neatly delineated national realms. DiEM25's alternative approach is to issue a call to arms to all Europeans to join in what we term "constructive disobedience." First, we offer a well-thought-out policy agenda for every nook and cranny of Europe, to be implemented at a pan-European level; then, when the establishment predictably turns it down, we embark on massive disobedience, including governmental disobedience (which is what one of us practiced when representing Greece in the Eurogroup in 2015). In this sense, DiEM25's European New Deal is the constructive part, which should inspire Europeans regarding what can draw us together into a single, transnational progressive agenda, so that we can organize the disobedience necessary at the local, national, and pan-European level. This is the way forward for progressives seeking practical solutions to problems that wreck the lives of the many across our continent. DiEM25, therefore, by calling for a pan-European campaign of disobedience with the transnational elites in order to create the European demos that will bring about Europe's democracy, is in tune with the left's traditional approach. In this Gramscian spirit, DiEM25 insists that our European rebellion should happen everywhere, in towns, regions, nation-state capitals, and in Brussels, without prioritizing any level over any other. The European New Deal, therefore, is a practical policy agenda for bringing together a pan-European network of rebel cities, rebel prefectures, and rebel governments into a progressive movement that becomes hegemonic in Italy, in Greece, in England—indeed, anywhere in Europe. Of course, one may cheekily ask: "Why stop at the European level? As internationalists, why don't you campaign for worldwide democracy—for an International New Deal?" Our answer is that we are doing precisely that (see the July 6 New York Times op-ed by Yanis Varoufakis, "A New Deal for the 21st Century"). Ideally, DiEM25 should link up with a Democracy in the Americas movement, which Bernie Sanders's "political revolution" could spark, as long as it extends beyond the US-Mexican border to include Latin America. And then onward to the Democracy in the Middle East, Democracy in Asia, and Democracy in Africa movements. But given that history has, for better or worse, delivered an internally borderless European Union, with common policies on the environment and a variety of other realms, progressives must defend our really existing absence of borders, the existing EU commons of climate-change policy, even the Erasmus exchange program that gives young Europeans the opportunity to mingle in a borderless educational system. Turning against these splendid artifacts of an otherwise regressive EU is not consistent with what the left ought to be about. • Europe has political and social standards for democracy and human rights, as well as for health and safety and the environment, that will not be respected if the continent splits back into national fiefs. In this respect, the cases of Poland and Hungary are already disturbing enough. • Integrated production networks are efficient, and part of the warp and woof of modern economic life. Disrupting them is extremely costly, as the experiences of the Soviet Union and Yugoslavia showed. • After a breakup, the smaller countries of Europe will be just as vulnerable to speculative movements of their currencies, the caprices of international investors, and the vagaries of their local oligarchies as they were before the European project got under way. • Population movements cannot be stopped, and they would become even more toxic politically if new barriers and electrified fences were built. The evidence for this is clear in Britain in the wake of the Brexit vote, and in Austria, Hungary, and elsewhere. In the long run, Europe needs a democratic governing structure, a proper budget, and the consolidation of many functions now maintained at the national level, with savings in some areas (the military), more uniform and effective protection of the weaker European citizens, greater effective sovereignty at the state and municipal level, and—last but not least—a common approach to the postcapitalist forms of production and distribution made inescapable by new technologies and the energy and environmental crisis. But this will be possible only after European peoples come to appreciate the continent as a constructive force in their lives—as a visible, palpable, useful presence. And that cannot happen until the structure and ideologies of European economic management have been changed, until there is a full escape from the dysfunctional molds in which those ideas were initially framed. Is this politically difficult? You bet! But Bernie Sanders and Jeremy Corbyn have shown that clear, sensible ideas—brave enough to challenge the entire existing system, but not unprecedented or utopian—can persuade large numbers of people. Europeans are ready for this. They know that Europe is in danger because it is undemocratic and, consequently, misanthropic when faced with crisis. Europe now needs an antidote to Euro-TINA: the toxic doctrine that "there is no alternative" within the European Union—except, perhaps, disintegration. That is what the Democracy in Europe Movement, DiEM25, and its European New Deal are about. And this is why we are determined to take our agenda to ballot boxes all over Europe by 2019. Get unlimited access to The Nation for as little as 37 cents a week! Yanis VaroufakisYanis Varoufakis is the former finance minister of Greece and co-founder of the Democracy in Europe Movement 2025. James K. GalbraithJames K. Galbraith is the author, most recently, of Welcome to the Poisoned Chalice: The Destruction of Greece and the Future of Europe (Yale University Press, 2016). He teaches at The University of Texas at Austin and is an adviser to the Democracy in Europe Movement 2025.